Of way more interest than the anniversaries of famous albums are those mysterious alignments that make me feel as if something greater than a publicity department is suggesting I listen to something. Possibly the universe is trying to tell me to get off the beaten track of my iPhone shuffle. Possibly it's the ghost of Hank Williams who is giving me a shake. Who knows? As Leonard Cohen says: you hear funny voices in the tower of song. In this case, the voices began in December with an article in The New Yorker by the brilliant novelist Zadie Smith. 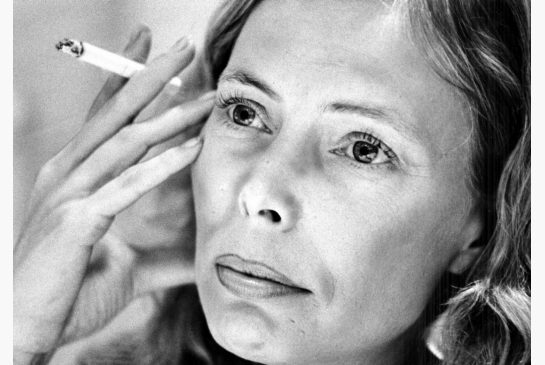 "Some Notes on Attunement: a voyage around Joni Mitchell" charted Smith's improbable passage from musical disdain to fascination. And then, the annual Toronto arts festival, Luminato, announced that it would be honouring the Saskachewan-born singer and songwriter this June. And then, I walked into a downtown club last week and heard the gifted young Toronto performer Jordan John doing an exquisite cover of Joni Mitchell's "A Case of You." And then, my friend the musician and songwriter Douglas John Cameron said something in passing that, the moment he said it, struck me as absolutely outrageous and absolutely true. Cameron said: "Any list of the greatest Canadian songs would begin with every single song on Blue." That was what the voices were saying. For some reason I had not listened to Mitchell's album Blue for a long, long time. The more fool me. My friend Cameron is right - or as right as anyone ever is with lists of this sort. The songs - "All I Want," "My Old Man," "Little Green," "Carey," "Blue," "California," "This Flight Tonight," "River," "A Case of You" and "The Last Time I Saw Richard" - are as good a top 10 as any. More than four decades after Blue was released, it remains a shockingly beautiful album. To be honest, I was happy not to have listened to it for a while. The staleness of overfamiliarity didn't come into play the first time I put my headphones on to give it a recent listen, although I must admit that I have been listening to it obsessively ever since. All these years later, it's still a little strange - like its creator, one suspects. The album's melodies, its arrangements and its lyrics are entirely unique. But they are also weirdly, idiosyncratically precise. There's nothing flighty or loose about it. The bluesy vocal trill in "My Old Man" seems inadvertent in its delicacy until Mitchell repeats it, note for note, throughout the song. It's hard to imagine a song as eerie and discordant as "Blue" being a hit today, much less the song that gives a big release its name. Has a Canadian winter ever been more effectively evoked in song than in Mitchell's "River"? Has a travel story ever been told with more wit and fun and pleasure than in Mitchell's "Carey"? And, really . . . is there a more gorgeously lopsided, oddly phrased, heartfelt, heartbreaking and somehow perfect love song than "A Case of You"? And, as if that weren't enough, has a song ever been sung more beautifully? But what most surprised me about returning to Blue was to be reminded of the striking image Mitchell presents of herself in it. The persona of the singer in each one of Blue's songs is an important component of their musical stories. The young woman who wrote and sang these 10 remarkable songs - so beautiful in performance as the many YouTube clips from this era attest - comes across vividly to listeners. She is strong, independent, smart, funny, sophisticated, confident and passionate. And those characteristics, now as then, are worth singing about. This article has been viewed 4,745 times since being added on March 6, 2013.